Furnish or post copies of any warranties covering parts or service. Use quality CARQUEST Auto Parts, guaranteed coast to coast. 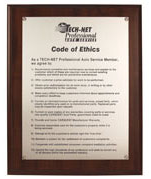 Provide and honor CARQUEST manufacturer warranties. Exercise reasonable care for the customer’s property while it is being serviced. Make every effort to fix the customer’s vehicle right the “first time”. Maintain a system for fair settlement of customer’s complaints.